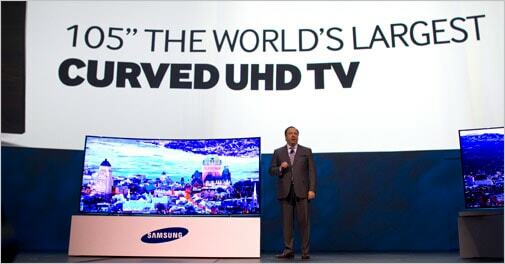 The company unveiled a 105-inch screen UHD TV, which it claims is the world's largest curved UHD TV. The U9000 series includes 65-inch and 55-inch curved TVs. Samsung has launched its curved ultra high definition (UHD) TV and a range of products including tablets at the 2014 edition of the Consumer Electronics Show (CES). Besides, the 12.2-inch Galaxy NotePRO and TabPRO tablets present mobile users with a display that offers a resolution of more than 4 million pixels. The Galaxy NotePRO and TabPRO line is completed by the Galaxy TabPRO 10.1-inch and 8.4-inch as well. The New Year also marks the debut of Samsung's Chef Collection, a range of premium kitchen appliances. It includes refrigerators, stoves, ovens, over-the-range microwaves and dishwashers that can clean without missing corners. Samsung also showcased a new washing machine and washer dryer with a maximum laundry capacity of about 25 kg. The company did not reveal prices and global launch dates of these products. "Four trends are shaping the technology demands of consumers: connectivity, urbanisation, aging and new environmental and societal risks," Samsung Electronics co-CEO Boo-keun Yoon said. The home of the future has to protect, be flexible and be responsive and needs technology that will connect all the digital dots in the lives of consumers, he added. "Samsung is in a better position to deliver solutions for the 'Home of the Future' than anybody else - helped by our broad product range, integrated development and manufacturing and our large global network of partners," Yoon said. Samsung's Smart Home service puts consumers in control of devices and appliances in their homes with a single application. With a single application on a smart TV, digital camera, smartphone or wearable device like the Galaxy Gear, consumers can control home devices, ranging from washing machines to lights to air-conditioners, both at home and on the road. The controlling device also responds to voice commands. Smart Home will initially offer three main services: Device Control to manage devices at home; Home View, to monitor homes in real-time through built-in cameras on appliances or a digital camera from their smartphone; and Smart Customer Service, which provides service alerts and assistance in servicing.